In 1980, Suellen and I moved to Mexico where I was invited to teach at the University of Guanajuato. 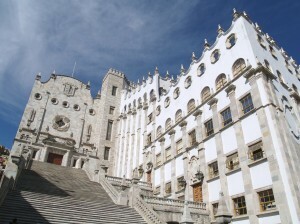 A lovely mountain town about 200 miles northwest of Mexico City, Guanajuato is rich in history, culture, and tradition. It’s the heart of the Bajío, a broad, fertile region known as the breadbasket of Mexico. Graham Greene’s novel, The Power and The Glory, uses the Bajío as a backdrop. My students were in their twenties and getting married and having babies. During our year in Guanajuato, Suellen and I were invited to any number of “baby welcoming” parties. About a month after a baby arrived, the parents would host a party to introduce the baby to family, friends, and neighbors. It was like being a very small debutante. The parties were quite touching. Attendees took note of the fact that a new member of the community had arrived. We implicitly agreed to help the child grow and prosper. We also told stories, offered advice, and gave presents. So when should you name your baby? It was a question I had never considered before… and that’s the point here. A central tenet of critical thinking is that we should question our own assumptions. As the world has changed, have our assumptions changed as well? Are they still valid? Were they ever? But how do you question your assumptions if you don’t realize that you’re making assumptions? I assumed that one should name a baby before it arrives. I never questioned it. Why would I? It’s the natural order of things, isn’t it? Learn a new language – many assumptions are bound up in our language; especially the metaphors we use. Learn a new language and you’ll pick up new metaphors and identify hidden assumptions. Travel to a different country – paraphrasing Yogi Berra, you can learn a lot just by observing. Talk to people who aren’t like you – living in a diverse community (or working in a diverse company) helps you think more clearly. You probably won’t suffer from groupthink. Study history – it’s amazing what people used to think. Ask yourself a simple question – why do I think that? Questioning your assumptions doesn’t necessarily mean that you should change them. You may find that they still work quite well. We didn’t change our baby naming assumptions, for instance. We named Elliot well before he arrived and he turned out just fine (I assume).